This week we are spotlighting Makeup Artist Lisa McKinney (This & That). Lisa always makes such beautiful cards, but her CAS cards are frequently on the SCS CAS Fav's of the week list! She rocks! When I do these "interviews" I ask each person to send me a picture of themselves. It's is so "Lisa" that she chose this picture to send (one of her and her hubby)... Lisa is so very dedicated to her family. She just adores them all and it's so evident when you interact with her. Does her smile not just consume her whole face? This girl is ALWAYS so bubbly and cheerful and positive! These are two of my very favorite traits in people and though there are more reasons, these two are the biggest two reasons I just adore Lisa! This is Lisa's favorite card, which is interesting because there is nothing CAS about this one! Look at all the detail, right up my alley! The colors are so stricking. Here's what Lisa had to say about this card... "This card is probably my favorite because of not only the colors (autumn! ), but how it incorporated a bunch of textures and layers. Moody in the Pumpkin Patch is STILL my favorite Moody and though she's not colored wonderfully (pre-copics) I still like the way she graces the front of this card. I was having a LOT of fun with my Cuttlebug when I made this card." Well I had my favorite card picked out until I saw this one. 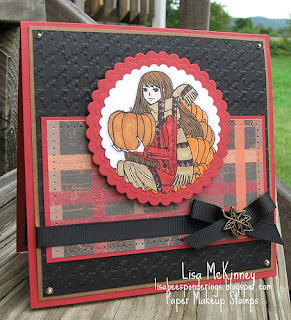 I love the colors Lisa chose, it shows her 'signature' embossing folder piece and Thanksgiving is just my favorite time of the year! As gorgeous as the card is, I really LOVE her story she shared on the post!! When did you get started stamping? Around the fall of 2007. I found a card making group online and was like "wow, I think I can do that!" And though some of my first attempts are shameful, through the course of joining various groups, starting a blog, competing in challenges and trying new techniques I've really grown in what I'm capable of producing. Tell me 5 songs or artists on your iPod right now. Well, I'm behind the times and don't ahve an IPod...but my playlist on my blog currently has a TON of songs from GLEE...but then also Lady Antebellum, Faith Hill, Cold Play and Lionel Richie...yeah, I'm a music eclectic! All Stylists have a go to accessory or tool... what's yours? Definitely my Cuttlebug. Now that I have it, I couldn't live without it...I use it on nearly ALL of my cards--whether for embossing or for using my Nestabilities. What's your favorite flavor of ice cream? Mmmm, Ice Cream. I love fruity ice cream like peach. But my FAVORITE ice cream is homemade. My parents bought an ice cream maker when I was visiting them this summer and...WOW! Best ice cream I've ever eaten! They had made strawberry ice cream with real freshly picked strawberries and other organic ingredients. It makes all the other ice creams seem blah! Now we are going to try to buy one for our family because we are HUGE ice cream fans. Where do you find inspiration? Most of my inspiration comes through various challenges. My favorite ones are the sketch challenges because deciding on layouts seems to be the most challenging part for me! So already having a layout takes away those moments of staring at a blank card front wondering what on earth I'm going to do! I also really like embellishment and technique challenges. I'm always looking for new ways to use the supplies I have. Do you have a favorite technique or style? I love doing folded cards...but also CAS cards. I am notorious for trying to use up every inch of space, so the CAS style has pushed me out of that box. I also love dry embossing--because I can use my Cuttlebug of course! LOL! What is your favorite color palette? Earth tones! I totally love using chocolate and olive and rust...probably why my favorite season is Autumn. I just love the richness that those colors have. When your 'mojo' takes a spa day without you, what gets your creative juices flowing again? I just go to a gallery of some sort...usually Splitcoast and look through it or cards I tagged as a favorite and I usually can get inspired that way. If that isn't working than I pull out past copies of my crafting magazines and check out pages that I've marked.But then there are days when I just have to walk away for awhile. I go read books, play the piano or just play with my kiddos. My mojo usually comes back shortly thereafter! When you aren't stamping, what do you like to do? Spend time with my boys, Cook, Read, Play Piano and just chill out! We love doing things as a family--typically going for rides on a John Deere Gator or our 4wheelers all over our Kentucky farm. Or sometimes we just sit on the porch and watch the butterflies. Tell us something, not stamping related, about you...Um...I admit that I'm a nail polish addict. I have a TON of colors, but can't seem to resist a new sparkly shade. I love painting my toenails! I also am a pianist. I've played piano for 25 years and have won a few competitions. It's my release when I'm moody or frustrated because I can always find a song to match my mood. And one more thing is that I'm almost JUST as addicted to cooking magazines as my crafting magazines. I adore cooking and have more cookbooks than one person really needs...and I'm an avid FoodNetwork watcher. Well that wraps up this Artist Spotlight. 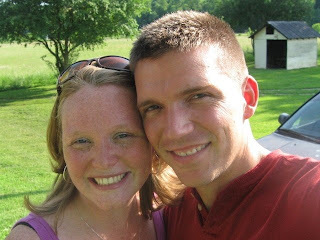 You can leave a comment for Lisa on this post, or better yet head on over to her blog and leave her a hug there! Awhh. Tangii you are just too sweet! I totally <3 you!!! Love both of these cards! Happy day to Miss "Lisabee"!! Lisa, you are one of the sweetest people on the planet. It's been such a pleasure "working" with you!